Before committing to any treatment, a handy tool called ClinCheck means that you will know exactly what to expect at the end of your treatment. Your predicted final result will be shown to you as a virtual image so you can decide whether that’s the result that you’re looking for. Each Invisalign aligner is 100% removable, so you can eat and drink as normal. The only difference is that you’ll have to take a moment to remove your aligners before you eat and drink. You can drink water while you’ve got your aligners in and this will help to keep your aligners pearly white. You should keep your aligners in for at least 20 hours per day, to give them the best chance of working. No one will know you’re wearing Invisalign aligners unless you tell them! Invisalign is the best way to get a brand new smile without having to have metal wires and brackets attached to your teeth. It can be embarrassing to have traditional metal braces if you’re no longer a teenager, but that’s not a problem with Invisalign. Don’t change your lifestyle, change your smile with aesthetically appealing almost invisible Invisalign aligners. Your aligners are removable which means that you can keep your teeth and your aligners clean. When you remove your aligners to eat, you’ll need to clean your teeth before you put them back into your mouth. This means that your oral health will improve as you will actually be brushing your teeth more often. It’s always wise to get all of the facts before you commit to a treatment. We’re dedicated to giving you the best possible Invisalign treatment, care and advice. 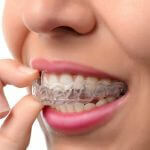 For more information about Invisalign, click here. If you’re not sure whether Invisalign is for you and you would like some more information, contact us to begin your Invisalign journey. How Do Damon Braces Compare?